After Nintendo announced the first month sales figures for the Switch console, some people are ready to call it a shining success, or the second coming of the Wii. 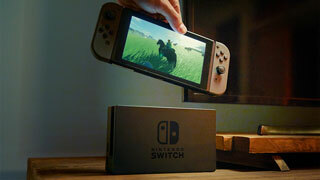 Others dismiss the numbers, and say that the Switch has no chance of sustaining its early success. Who's right? No one knows, and it's too damn early to be making sweeping predictions just yet. Yes, the Switch has sold well thus far, but there are four good reasons that we shouldn't be eager to make a final call on how the Switch will do. Nintendo has a history of bringing devices to market without sufficient retail supply. Yes, demand was high for both consoles at launch, but Nintendo seems to be the only manufacturer whose supply consistently falls so far short of demand. We've seen it happen with the Wii, the Wii U, the NES Classic, and even the 3DS to some lesser extent. Many times the only place to find a Nintendo console a couple of days after launch is on eBay for a multiple of its retail price. That isn't helped with a console like the Switch, which required you to not only find stock of the console itself, but the Pro controller and other accessories for the best experience. Nintendo meeting demand with the console and its add-ons will be critical for its success going forward. Nintendo is always praised for its first-party titles, but the success of the Switch will likely be determined by how well it can attract third-party support. We know that Ubisoft plans to bring at least a few games to the Switch, and EA will have FIFA there as well. Minecraft is coming to the Switch in May, and there's a version of Skyrim coming later this year. But until Nintendo can show that the Switch has the power and the install base to bring big, new-release AAA third-party games to the console, it won't make the jump to the next level of success. The biggest reason that no one should be making making any sweeping predictions for the Switch is simple: Nintendo hasn't finished the console yet. Sure, it's on the market, and it works fine. But we still don't have all the details of how its multiplayer system will work, and we still don't know what its monthly fee will be. No one has even seen the app that will supposedly power it, and we don't know some smaller details, like how you'll manage to get game sound from your Switch and chat sound from your phone into one set of headphones when you're on the go. There's still no Virtual Console, and we're not still not sure how that will work when and if it does makes its way to the console. While early sales for the Switch were strong, so were those of the Wii U, which fell off abruptly, and landed far short of its predecessor's success. Now that most of the diehard Nintendo fans have picked one up, we'll soon be able to see whether it can make the jump to mainstream appeal.